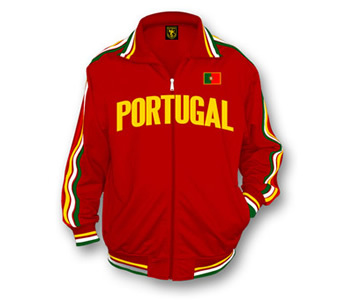 Portugal World Cup jacket made of heavyweight 100% poly tricot material. Features a large Portugal appliqué on the front and has an embroidered Portuguese flag on the upper front left chest. Sleeves have sewn on stripes and the bottom has striped ribbing. The jacket zips up front and has pockets on the sides. It's warm and comfortable to wear and looks good out on the field. Measuring instructions: Please note these jackets fit approximately one size larger than normal. So if you comfortably fit in an x-large, for example, then a large will fit you fine.